Every bride wants a wedding destination capable of delivering an unforgettable experience in a romantic location, and few brides and grooms will discover a more dramatic environment for their upcoming nuptials than Chiang Mai, an idyllic, thoroughly modern, city in Thailand. If you’ve been dreaming of a fairy-tale wedding, you’ll find it in this charming corner of the country. For a million reasons. This friendly nation has become a wedding mecca for couples from around the globe due to an abundance of beauty and and the welcoming embrace of the people. Brides and grooms are seduced by pristine beaches, historic sites that have no equal, and a paradise-like ambience not found elsewhere in Asia. The weather cooperates most of the year, which is why couples plan their destination weddings for certain months, but plenty of couples on budgets come when the weather’s less than perfect to take advantage of discounts on hotels, airfares and all-in-one wedding packages that take the work out of event planning. Whether you’re planning a small, intimate affair or you intend to invite everyone you know to join the celebration, you couldn’t pick a better place to stage your wedding because there's no place like Thailand anywhere on Earth. Couples searching for wedding locations reminiscent of paradise find in Thailand all of the resources one could want or need. This nation is rich in a diversity of religions, so whether you desire a ceremony that’s Christian, Muslim, Buddhist or another major faith, you won’t have trouble finding the appropriate officiant to perform your marriage ceremony and bless your day. Paperwork required by Thailand and your home government won’t add stress to your pre-wedding jitters, either. Thai officials are eager to help couples circumnavigate all of the bureaucratic details of destination weddings. Embassies and law firms are available to couples who need help navigating the smallest detail, from precise translations to affirmations and verification's so everything is legal and binding. Marriages conducted in Thailand are recognised around the world. 1. Frequent travelers to Thailand choose Chiang Mai over Bangkok because it’s an idyllic mix of city and country. Chiang Mai is devoid of Bangkok’s hustle, bustle, traffic, crowding and smog. It’s large enough to provide guests with lots of entertainment, but small enough to navigate during their stay in this charming city. 2. Explore Chiang Mai on foot. Visit the Old City and the New City effortlessly. Wander streets, shops and sites along the Ping River. The Sunday Market (Night Bazaar) in the Old City isn’t to be missed if your wedding party is in town over the weekend, or make visiting this market an essential part of your honeymoon itinerary. 3. Stroll ancient sites established in Chiang Mai 700 years ago when this was the capital of the Lanna Kingdom. Breathtaking temples and landmarks, you’ll find plenty of sports activities to liven up your in-country stay and the dining opportunities in Chiang Mai are delicious, ranging from small food stalls to luxe eateries staffed by top chefs. 4. If you marry in Chiang Mai, it's the ideal place for your honeymoon, too. This conservative haven isn’t frequented by "brash" tourism, so your Mum can attend your wedding without fainting and the two of you can enjoy strolling around without being bothered by offensive sites and sounds. 5. Chat up a monk. You'll encounter many holy men and they are both kind and eager to talk to westerners and brush up on their English language skills. What a fortuitous trade-off! You two get the benefit of sage advice to guide your married life and you’ll help one or more monks achieve their goals of properly speaking the Queen's English! 6. Save money on everything associated with your Chiang Mai wedding. Because the cost of living is lower here than in Bangkok, you will likely spend less on everything from lodgings to attire. Want to see how creative you can get by planning a destination wedding on a shoestring? Marry in Chiang Mai during low season and save a bundle. 7. Relax and de-stress. There’s a reason ex-pats retire to Chiang Mai: The crime rate is low, thus you and your guests needn’t worry about walking around at night while taking in the sights, tastes and fragrances surrounding this enchanting city, no matter what time of the year you visit. 8. Beauty is all around you. Whether you stage your wedding at a cave, waterfall, mountaintop, jungle or leave your cares behind by letting a skilled hotel wedding planner take care of every detail on site-—you never have to worry about the quality of your wedding photos because no matter where you stage your ceremony in Chiang Mai, you’re going to wind up with photos that are gorgeous enough for magazine covers! Because Chiang Mai is a sophisticated city with a vibrant hospitality industry, the number and quality of accommodations you’ll find could surprise you, but why not choose the best-of-the-best; The Akyra Manor Chiang Mai Hotel is a jewel nestled into the heart of the city. This property has won countless industry awards from reviewers around the world. Visitors to our Chiang Mai Hotel can't stop raving about the quality of the service, treatment and amenities they find only at Akyra. Located in the heart of the city on Nimmana Haeminda road, but you’ll feel like you’re in a private world thanks to this luxury hotel’s signature design, layout and ambience. The Akyra brand has built a sterling reputation over the years, so you can count on the Chiang Mai property to exceed your expectations. From arranging for excursions, classes, attractions, tickets and making recommendations to sharing insider tips on getting around the city so you and your guests don’t miss a thing, Akyra Manor Chiang Mai’s will ensure your wedding day, reception and visit will stay with you and your guests forever.. And isn’t that how you want your party to feel when they attend your destination wedding? 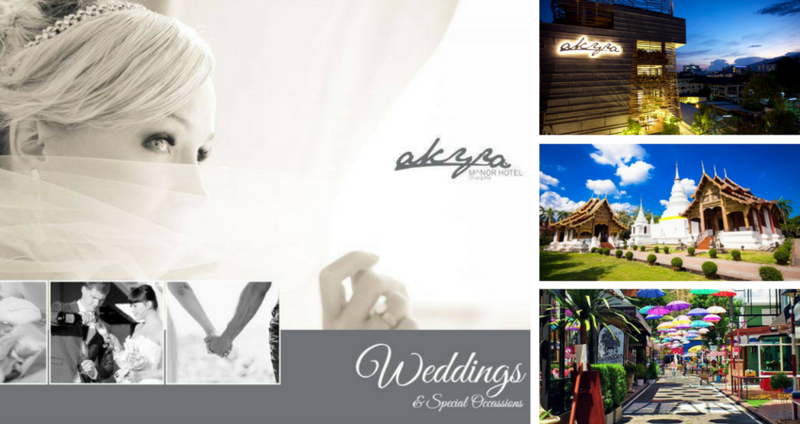 Let Akyra take the work out of planning your wedding with their onsite wedding planner to set up and stage every detail so all that’s required of the bride and groom is deciding which items within the wedding packages they want. With the basic Akyra wedding package, twosomes receive a 3-day/2-night stay in a deluxe suite, daily gourmet breakfasts, a decorated venue, bride and groom in-room massages, hair and makeup services for the bride, a photographer and a prix fixe reception menu for the couple and up to eight of their guests. The package includes a light and sound system and complementary soft drinks keep flowing throughout the event. Want to add extras to your wedding, a DJ and a second photographer if you want to capture every moment on video. On the other hand, if you’re all about a scaled-down affair, work with your wedding planner to tailor your wedding to your wishes so you get exactly what you want. View the hotels wedding brochure for details on packages and wedding options. One of the most important aspects of choosing a wedding venue at a destination is knowing that the two of you will enjoy a private, intimate time, our all-suite rooms reflect the exclusivity of this hotel. There are 23 suites in which provide privacy and intimacy. Every suite is spacious, so you enjoy plenty of space to move around. Since the hotel is situated in Chiang Mai’s Artist Corner, lodgings reflect the neighbourhood’s up-scale vibe captured by architects and designers when they imagined these unique, “outside-living-in” suites. Snuggle between 430-count Egyptian cotton sheets and lounge in matching cotton robes and slippers supplied all to guests. And wait until you see the bathrooms attached to every suite that will probably remind you of spas you've visited. Fluffy, oversized towels await as guests discover all of the comforts of home--and some of the comforts they wish they had at home! Included within every suite are an LCD TV, naturally-sourced toiletries, an espresso machine, iPod and iDock with music library and Bluetooth speakers. And of course, there’s a fully-stocked mini bar and complimentary high-speed Wi-Fi connectivity throughout the hotel.